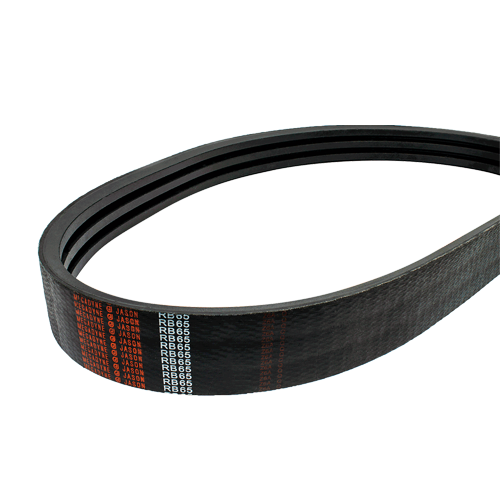 UniMatch® Banded V-belts are available in Classical sections B, C and D, and feature the same premium construction as the individual belt, bonded together with a fabric-neoprene top band. UniMatch® Banded V-belts are available in Classical sections B, C and D, and feature the same premium construction as the individual belt, bonded together with a fabric-neoprene top band. These belts are often used on vertical shafts and where belt vibration, whipping, and turn-over must be minimized. Banded Classical V-belts are specified by a number followed by a forward slash which indicates banded construction and number of ribs, and a letter/number combination indicating the base belt part number. Banded Construction – Fabric/Neoprene top band enhances stability and prevents belts from turning over or coming off the drive. Minimizes vibration. Are you interested in Unimatch Banded Classical V?